This welcome Lyrita release contains a pair of cello concertos from two English composers who experienced differing fortunes throughout their career. Arnold Bax is by far the most renowned of the two. Disappointingly his considerable number of recordings has not translated into concert and recital performances. Stanley Bate is not widely known although in the last five or six years several of his works (Third Symphony; Viola Concerto; Sinfonietta No. 1 and Second Piano Concerto on CDLX7282) have been released on Dutton Epoch. In the 1930s Bax was at the peak of his compositional powers. 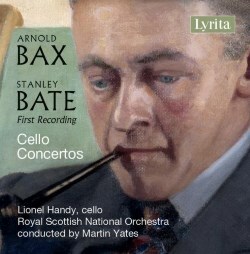 With his tone poems some years behind him Bax’s Cello Concerto from 1934 was written between his Symphonies No. 5 and No. 6, a period during which he was writing some interesting chamber scores including a String Quintet and an Octet for horn, piano and string sextet. At the prompting of pianist Harriet Cohen, Bax wrote the Cello Concerto for the Spanish virtuoso Gaspar Cassadó, a task he found extremely challenging. Cassadó the dedicatee premièred the work the same year at the Queen’s Hall, London with the London Symphony Orchestra under Hamilton Harty. Cassadó soon became uninterested in the concerto, however, it was taken up by renowned soloist Beatrice Harrison who performed it on two occasions at the Proms. Music writer Mark Morris in his book A Guide to 20th Century Composers (1996) has expressed the view “The Edwardian flavour of the Cello Concerto rambles too much to be of real interest.” Rarely appearing on concert programmes today there is, however, an excellent account played by soloist Raphael Wallfisch with the London Philharmonic Orchestra under Bryden Thomson that he recorded in 1986-87 at London for Chandos. The opening Allegro moderato with its fresh, outdoor feel contrasted with a yearning intimacy reminds me at times of the Delius Cello Concerto from over a decade earlier. A nocturne, the central movement marked Lento has a wistful rather illusive quality and the closing Allegro molto extrovert on the surface contains an undertow of nervous tension. As a pupil at the Royal College of Music, London Bate’s list of teachers included Ralph Vaughan Williams, Arthur Benjamin, R.O. Morris and Gordon Jacob; all of whom had studied with Stanford. Bate later studied privately in Paris with Nadia Boulanger and also with Hindemith in Berlin at the Hochschüle für Musik. Bate was one of a group of British composers who stayed in the USA during the Second World War years; an absence that undoubtedly harmed his career in Britain. Returning to London in 1949 Bate’s music was for the most part ignored and experiencing severe personal difficulties he committed suicide in 1959. Bate’s entry in Grove Music Online ends with the rather pointed comment, “Bate was highly prolific, but his music, with a few exceptions, lacks enduring quality.” In 1949 Bate had returned to England and lived in London writing his Cello Concerto in 1953. It was introduced the following year at the Eastman School of Music, New York. The booklet notes do not state the name of the soloist. Here Bate uses the orchestra only sparingly helping to keep the focus of attention on the soloist who plays virtually continuously. Marked Allegro the first movement, evocative of an English coastal scene in winter, has a squally, windswept quality combined with a nervous, rather agitated character. Reminding me of the sound-world of Alan Rawsthorne the arresting dark and intense central Andante has long lyrical lines for the soloist. In the final movement Allegro vivace with its powerful undercurrents and sense of imminent storm. Compared to Raphael Wallfisch in the Bax (review), Lionel Handy’s intonation is nowhere near as pinpoint but it feels as if he is searching deeper into both scores, providing a greater sense of engagement. I admire the wealth of tone colours which Handy produces in a performance that feels unerringly spontaneous. With strong assurance the Royal Scottish National Orchestra excels under Martin Yates and provides sensitive accompaniment throughout. Recorded at Henry Wood Hall, Glasgow the engineering team for Lyrita produces sound quality which is relatively clear with an ideal balance between cello and orchestra. Written by Paul Conway the essay in the booklet is to a high standard, yet, curiously no recording date is given in the liner-notes. Reviving two worthy English cello concertos Lyrita continues to do English music a great service.